This guide will walk you through the steps to setup DDNS on a Cisco Wireless Router. Step 1: Open up your favorite browser and go to the router’s default gateway address. This router uses a self-signed security certificate and you will need to confirm the exception. Step 2: Login to the router (common default value listed below). • Cisco RV110W Username: cisco and password: cisco. The password is case sensitive. 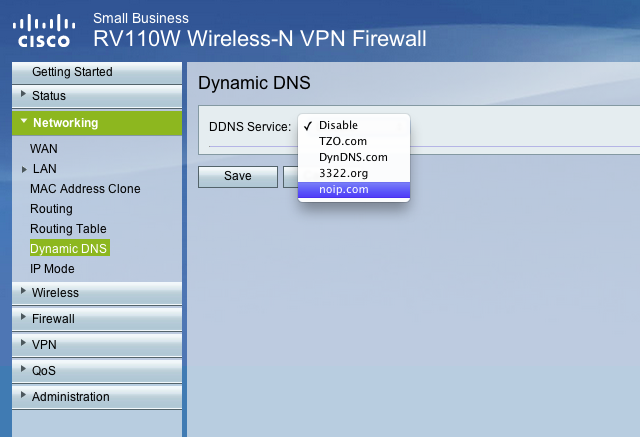 Step 3: Go to “Networking”, on the left hand side, then “Dynamic DNS”. Step 4: Enter your account info. When you click “Test Configuration”, if everything is correct you will receive the message, “DNS is updated successfully”. 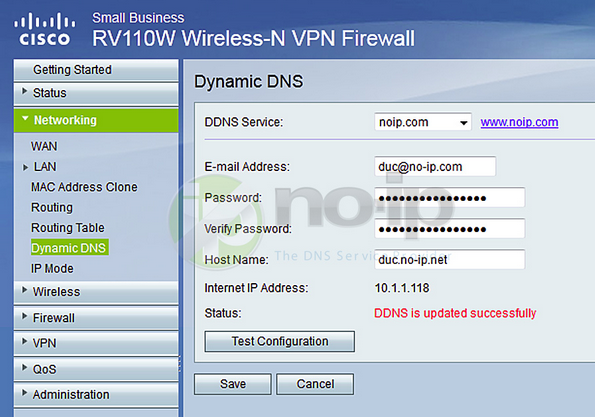 Once the test is working properly “Save” the settings and your router will perform Dynamic DNS to your host.domain.com. Can I Temporarily Disable Monitoring while I Fix my Server? Notice About Service: What do the Different States Mean? What Does "Auth Code Incorrect or Not Supplied" Mean? How Long Until the Domain I just Registered is Active? My Domain is in the Redemption Period, What is This?